This page is your place for All Uncategorized Tractors & Equipment. There have been many tractor brands, trials, experiments and other attempts over the history of the early farming years that had limited success, failures or somewhere in-between (Such as the Fitch 16-26 4WD tractor shown here). They had made their way into existance and farmers either bought these pieces of equipment or rejected these companies' attempts to interject their products into the industry. For whatever the reasons there were, these tractors and pieces of equipment should not be forgotten and this page was created by Fastrac to give those viewers that have an interest in these pieces, to have a place to come to. and we'll see it gets attention.......Just make sure to include the phrase "Other Tractors" in the subject line! The Four Drive Tractor Company, Big Rapids, MI - This website is on the Four Drive Tractor Company of Big Rapids, MI. 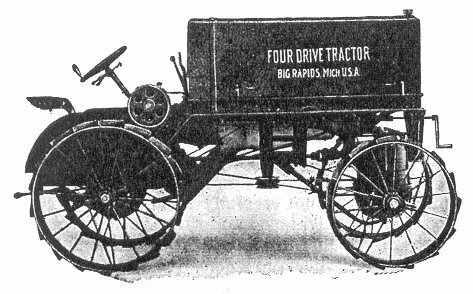 The company produced the "Fitch" Four Drive Tractor from 1916 to 1930. Paul Wilson's Vinatage Tractors web site - Website has quite a few "Oddball" or not so common vintage tractor pictures and information. Friday Tractor.com - Website dealing with the Friday Tractor Company of Hartford, Michigan. Site is attempting to register all known Friday tractor owners, etc. FarmCollector.com - Farm Collector is a monthly magazine focusing on antique tractors and all kinds of antique farm equipment. Gibsontractor.com - Lots of good wuality photos of a Gibson Tractor restoration project. Silverking and Plymouth Tractors Unofficial Website - This site is dedicated all the tractors produced in the last century by the Fate-Root-Heath Company of Plymouth, Ohio. WheatFarm.Com - a website about farming and mechanical equipment. TractorData.com - United Kingdom based website with lots of Vintage Tractor photos. Jeremy Fiorelli's Huber Tractor Home Page - Lots of links to other tractor sites. David Bradley Homepage - This site is dedicated to the David Bradley walk-behind tractor. David Brown Tractor Website - "Dedicated To All David Brown Enthusiasts". Japanese Used Tractors - Japanese-Used-Tractors.com - Find Used Tractors of any maker Iseki, Kubota or Mitsubishi. Gibson Tractor E-Group Site - A community for folks owning or interested in Gibson Tractors and for folks owning or interested in Gibson Tractors to exchange thoughts, sell and swap parts and fixes. The National Russell Collectors Association - founded in 1998 to become a network for all who are interested in The Russell & Company and the preservation of its history and equipment. Gibson Tractor Club Home Page - Gibson History, Clum Membership, Etc. Huber Tractor Museum - Lots of photos of Huber traction engines, etc. Empire Tractor Club - This club is for anyone owning or interested in the history and preservation of the1946-1950 Empire tractor. Coolspring Power Museum - Stationary gas hit and miss engines, throttle governed engines, flame ignition engines, hot tube ignition engines, and hot air engines ranging in size from a fractional HP up to 600 HP. All are among the permanent exhibits at the Coolspring Power Museum in Coolspring, Pennsylvania. Sparky Tractor & Implement Website - Not what you think. This is a site showing a unique hobby that one man has "dinked" around with. He makes antique tractors and Implements from old spark plugs.....hence the website name. These things are different and really cool! You should take a look if you get a chance.